The 2019 Wisconsin Lacrosse Federation State Championship Games/Invitational and All Star Games will be at Schneider Stadium at Carroll University on June 7 & June 8, 2018. Details for the games, times and brackets are on the www.wisconsinlacrosse.com website under the State Championship Tab. May 23, 2019 Last day for season games considered for seeding. Varsity Season Games. All conference and nonconference contests must be completed by the following dates: Girls and Boys - May 23, 2019. Games that are postponed due to weather or other circumstance, need to be completed by 7pm, May 23, 2019. Games played on May 23, 2019 need to report scores to the tournament director asap to ensure the games are included in the seeding consideration. Games played after May 23, 2019 will not be included in the seeding consideration. Rescheduling Playoff Games. If both parties agree to reschedule or modify playoff games due to weather, conflicts, etc. the contests need to be completed on or before the next scheduled playoff game. Coaches need to notify and confirm with the officials/umpires the new time, location and date that needs to be covered. Opt Out: Playoffs are an All-in playoff format. Teams choosing to opt out of the playoffs need to send an email and text the tournament director by May 18, 2019 (Third Saturday in May) Contact: Lisa Kirkpatrick, wlfstatechampionship@gmail.com – 262-391-1148 cell). Teams that opt out after May 18, 2019 and or forfeit a playoff game will cover all expenses for both teams. This includes, bus fees, officials, field fees, and any other fees incurred by both teams. Seeding Brackets. 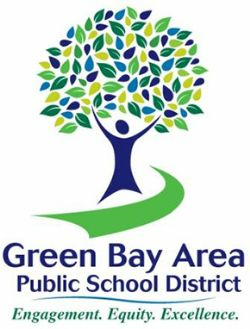 Seeding meeting is Thursday May 23, 2019 at 7:30pm. State Championship and Invitational brackets will be released the morning of Friday, May 24, 2019. Top 20 Teams make the State Championship Bracket. Top 16 Teams make the State Championship Bracket. HOME TEAM. High Seed is the home team and wears white. PLAYOFF OFFICIALS. During playoffs normal league procedures for paying the officials, suppling score keeper and other home team responsibilities will prevail with the home team until the semi- final games. During the Semi- final games the WLF is responsible for paying the officials only. During the Semi-Final games all home team procedures are still the responsibility of the home team, other than paying the officials. Post Season Travel Requirements. Travel Requirements for playoff games to minimize expenses and ensuring safe reasonable travel distances due to finals and graduation.  Identify reasonable neutral site that will ensure reasonable/equal travel time/distance for both competing programs.  Work directly with site management to secure dates/times for contests.  Cover any costs associated with site rental.  Identify which team is considered Home and which is Away (will be based on playoff seeding; higher seed = Home).  Possible locations include Mauston, WI (WI Dells), Eau Claire, WI and LaCrosse, WI – dependent upon teams affected. WLF will communicate with possible site management to share possible scenarios. TEAM ROSTER LOCKED. All teams participating in the WLF State Championship/Invitational need to submit their locked (no changes can be made once the roster is locked) roster to the Events Director, Lisa Kirkpatrick on or before 6pm on 5/23/19. Include a .jpg team logo as well. A. Roster- It is the responsibility of the coaches to ensure the players on the submitted locked roster are on the sidelines. No Changes of the roster are allowed after 5/23/19 at 6pm. B. Awards – 35 awards (individual trophies/medals) will be award to each team. The head coach will decide which players receive them. b. 1 Team Manager - Each team needs to designate a person as their Team Manager. This person will be the contact person for the WLF board and coaches. The team manager needs to be listed on the locked roster. The Team Manager cannot be a coach or a player but needs to be a person associated with their program. Only One Team Manager will receive a field pass. The WLF wants to create the best experience for all players, coaches, fans and families. All Information will be on the wisconsinlacrosse.com website. Good luck in the 2019 season! Watch Boys Rule Changes Video Please! New Boys Stick Rules and other 2018 rule changes!!! IMPORTANT!! - Please make sure that you are in compliance with the new stick rules for 2018. Boys sticks must comply with NCAA rules or NCAA+NFHS rules. Here is a link with a good summary of all the boys rule changes that occurred in 2017. US Lacrosse writes the rules for high school girls’ lacrosse, and those rules are endorsed by the National Federation of State High School Associations (NFHS). For 2017, US Lacrosse has produced a stand-along youth rule book for ages 14U and below. The rule sets in this book align with the principles of the Lacrosse Athlete Development Model (LADM), helping to ensure age-appropriate rules that allow athletes to progress and reach their maximum potential. 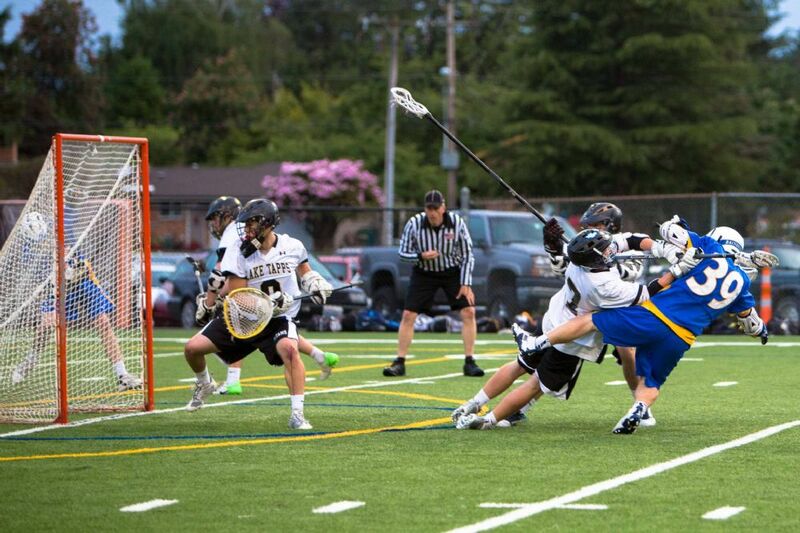 The National Federation of State High School Associations (NFHS) authors rules for high school boys’ lacrosse. 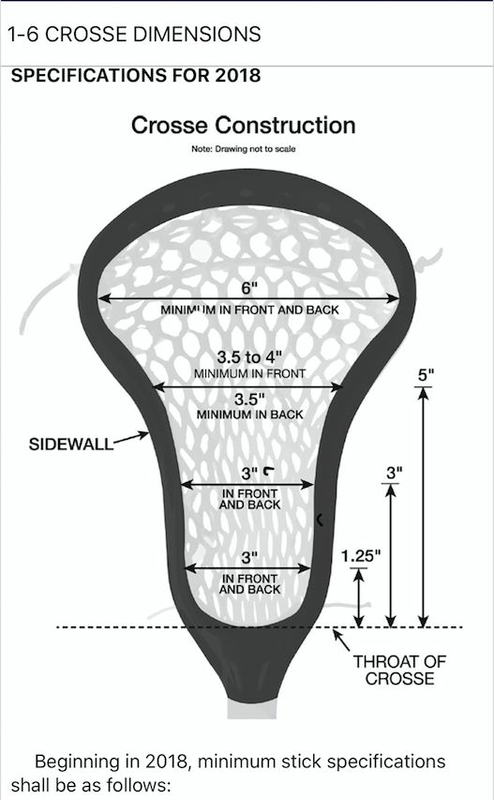 For 2017, US Lacrosse has produced a stand-along youth rule book for ages 14U and below. The rule sets in this book align with the principles of the Lacrosse Athlete Development Model (LADM), helping to ensure age-appropriate rules that allow athletes to progress and reach their maximum potential. The following is a post written by Gordon Corsetti, Manager of Officials Education for US Lacrosse. We say officials have the best seat in the house. While it’s true that we are the closest to the action we can’t watch the game the same way everyone else does, which is typically watching where the ball goes. I love being on the field officiating, but I only see one-half or one-third of the entire game depending on if I’m working in a two- or three-person crew. That’s because proper mechanics demand that at least one official watches the action that no one else is paying attention to away from the ball. The 2017 WLF Spring Jamboree (March 25 and 26 at Woodside Sports Complex) needs a new leader and committee. Dave Wollin will work with the new, incoming people into February for transitional purposes. If you are not a person that can step up to help put on this great event for the kids, please pass this on to many other people. This group needs to be in place by December, otherwise the Jamboree will not be able to continue. Thank you for your assistance in helping me hand this over to the next generation of lacrosse volunteers. Your help is greatly appreciated. Congratulations and welcome to the new, and returning WLF Board Members. See full Board below. Our next meeting is September 18. Please contact your League Representative if there is anything you would like to bring to the attention of the WLF Board. The Bay Valley Lacrosse Association would like to welcome the addition of two lacrosse programs to the conference. Kimberly Lacrosse Club began their program in the Spring of 2016 with the addition of youth lacrosse. 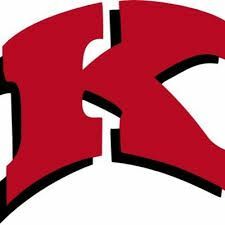 The rapid expansion of lacrosse in Wisconsin continues as the Kimberly Lacrosse Club will participate on the high school level with a Junior Varsity Boys team in the Spring of 2017. Stevens Point Lacrosse Club started their lacrosse program in the Spring of 2016 with the addition of boys youth teams participating at multiple levels. The club also plans to participate on the high school level in the Spring of 2017 with a Junior Varsity boys team. 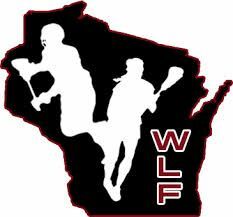 The WLF Board is an integral part of governing lacrosse in Wisconsin. This is your opportunity to have a say to who is on that Board. Membership registration will not only give you the opportunity to participate in the election, but also your contact information will be used to deliver important WLF news and announcements, including meeting agenda and minutes. If you are the person within your organization that should be considered the member representative, please continue reading. PLEASE VERIFY WITH YOUR CLUB/TEAM LEADERSHIP THAT YOU ARE INEED THE INDIVIDUAL REPRESENTING THE MEMBER. READ BELOW FOR DEFINITION. DUPLICATE REGISTRATIONS WILL VOID BOTH REGISTRATIONS. Below you will find the instructions for registering to be a WLF Member. This registration will be open throughout the election process, which ends August 28. Please follow the instructions for your own registration. If you have any questions or comments, please contact WLF Secretary Dave Wollin, . Register as the WLF Member. Only one registration per member allowed. 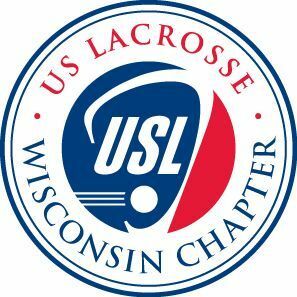 Membership of the WLF shall consist of the Wisconsin Lacrosse Federation Board of Directors in office from time to time, who are active members of U.S. Lacrosse, Inc. and those lacrosse programs in Wisconsin that compete under the guidance of the Wisconsin Lacrosse Federation, being defined by the level of competition of teams and a single team within a school or club. These competition levels are boys’ high school, girls’ high school, boys’ youth and girls’ youth. Example: If a program supports boys’ high school teams (JV, varsity or both), and girls’ high school team (JV, varsity or both), that program would consist of two Members of the WLF. If a program supports boys’ high school, girls’ high school, boys’ youth (senior, junior, bantam or all) and girls’ youth, that program would consist of four Members. 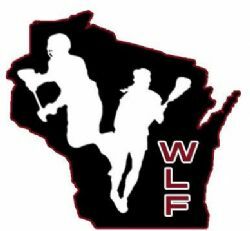 NOTE: Many Wisconsin Lacrosse members already have an account on the WLF website. If you have received emails from us, but have never entered into your account, enter your email address on the left and click the “Forgot Password” link. Complete all the account information, click the Submit button. Program members must be identified and contact information on file with the WLF Secretary no later than August 1 of each year. Enter your US Lacrosse Membership Number. Select the League for which your program plays. Select the WLF Member Program you are registering for. If you are registering for multiple Members within a program, i.e. Boys HS and Boys Youth, select one from the drop down, then enter the others in the field provided. If you are a WLF Board Member and a Program Member, you must register separately for each. When the ballot opens, these registered members will receive the ballot for the election process. Thank you for helping us to fill these important positions that decide the direction of lacrosse in Wisconsin. Be part of a historical crowd at National Sports Center Stadium in Blaine, MN as Major League Lacrosse brings a 2016 Playoff Semi-Final Game to Minnesota for the very first time on August 13th. The Semi-Final. Game will give fans the opportunity to watch the best professional lacrosse players at the highest level. Kids aged 3 and under do not require a ticket; however they must sit on their parent or guardian's lap (cannot take up a seat). 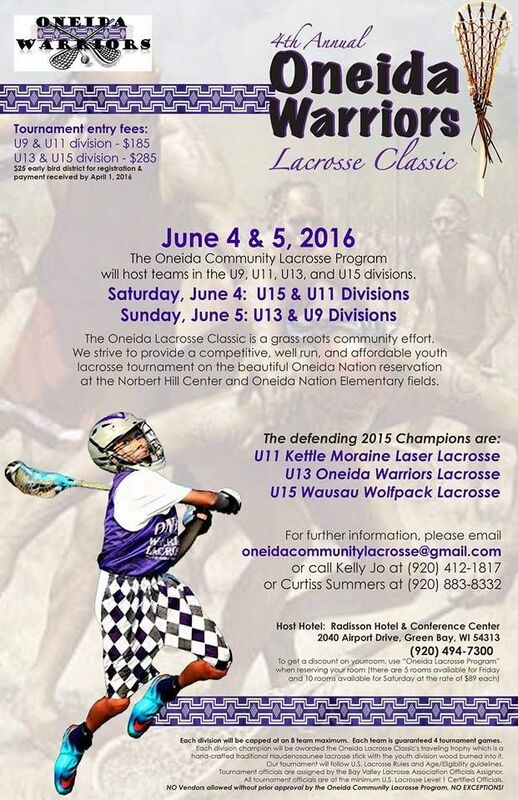 Major League Lacrosse is partnered with the Minnesota Chapter of US Lacrosse for this marquee event. Congratulations and many thanks to the above named WLF Hall of Fame inaugural class of inductees. 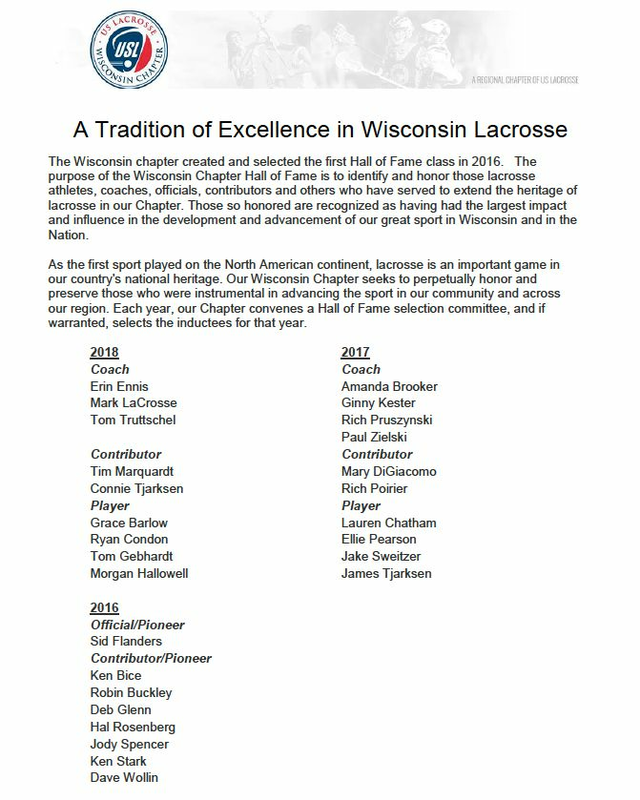 Each individual listed has helped to lay the foundation for our current Wisconsin Lacrosse Community. These individuals will be recognized at 2:45 pm on June 11th, at the State Championship venue, Carroll University. Please stay tuned for information on the upcoming Hall of Fame dinner, which will occur in January, 2017. The 2016 Wisconsin Lacrosse State Championship games are on June 11, 2016 at Carroll University - Schneider Stadium. Please see the attached information flyer for the event. In order to help make the event a success we some volunteers. Note: VolunteerSpot does not share your email address with anyone. If you prefer not to use your email address, please contact Lisa Kirkpatrick at (262) 391-1148 and she can sign you up manually. Please tell everyone to come and watch the fastest growing sport in America and in Wisconsin! See you there!